Let's all eat trafe for Chanukah! Personae: Me, shopping for low-carb food. Action: I'm sort of staring at the meat display, lots of salamis and sausages, and then various hams. 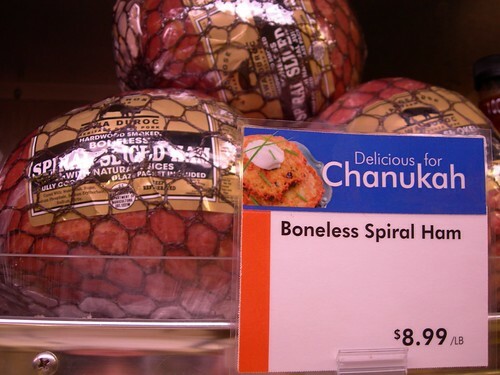 And the hams' price signs have all been tagged with festive PERFECT FOR CHANUKAH banners. Which I blinked at for a couple of secs, trying to decide if this was an example of truly monumental cluelessness or ... nah. It's just the Department of Monumental Cluelessness, Well-Meaning Division. Photos taken at the Balducci's on 8th Ave at 14th Street, on Sunday, 12/2. Update: As of Tuesday morning 12/4, the hams are now tagged with green "Perfect for the Holidays!" signs. By Popular Demand: If you're tickled by the Ham for Chanukah pic, visit my store at cafepress.com, where you can get it on a mug, or on greeting cards (stock up now for next year!). Um. Um. But you're in NEW YORK CITY, for god's sake. That would be, for G-d's sake. cluelessness? it's beyond that...it's like they must be from outer space...just landed on the planet yesterday. i'm really stunned. that's like...gosh, i don't know what that's like. Balducci's - I'm rendered speechless - I mean it might be understandable in a neighborhood minimart, but Balducci's is an upscale, sophisticated, not to mention expensive, establishment. They certainly ought to know much ,much better. Um, wow. And there were three separate signs? How did no one notice this? It's a deep mystery indeed. I hope bacon was on sale too. . .
that would make me boycott balduccis -- how stupid can they be? I really don't think this is malicious. Apparently in Ridgefield Ct, they are not as clueless. Go figure? I raced over to our store and they have no such signs and were horrified when I told them what was on the Internet. This is not exactly a Jewish town,but they know better. Ah, so now we know it's not a corporation-wide policy, but something that just happened in my local branch. Which was pretty much what I assumed -- it seems to be that most of the people who work there, while all friendly and service-oriented, are from backgrounds where they're not familiar with things Jewish. You hypocrite! Your blog has a photo of YOUR bacon and egg breakfast. Stop eating traife and people might take you seriously. I never said I don't eat pork -- I eat it daily. 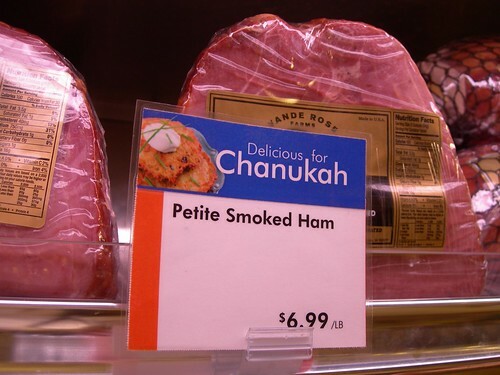 I just think it's hilarious that a food shop in Manhattan would promote ham as a Chanukah product. oh my goodness - may I link to this? This doesn't surprise me at all, given the number of times I have had to identify vegetables to checkout staff, not knowing the provenance of a cut of meat is wholly unexceptional. Not seeing how dumb it is to put ham and Jewish people together is far, far different then not knowing the lump of green is a BlippityBloo fruit from the Island Dumbdork. Give the employees some slack. This is HILARIOUS!! On behalf my colleagues, many thanks NKS for some great work-avoidance! I really don't see how any Jew -- trafe-eating or not -- could be offended by this. Obviously some low level, probably minimum wage, English-is-not-their-primary-language, overworked employee made up the signs at the management's direction and only looked at the product -- not the message. Balduccis should definitely be mortified. However, this is obviously an honest mistake. We don't exactly need to bring in the ACLU and the Anti-Defamation League here. The public embarrassment is punishment enough. While I am a trafe-eating-Jew -- a connoisseur of ham I am not. That product looks awfully big to be called a "petite ham." I too found it hilarious and not malicious. No need to call the Anti-defamation league -- I didn't even say anything to store mgmt because I didn't want to deprive others of the chuckle of coming across this little no-no. Do they have hand-outs with delicious holiday recipes like latkes fried in lard? OTH, if you were shopping at a kosher grocery, you wouldn't see such things, nu? Latkes fried in lard -- now there's an idea!